Roohan Realty is a local real estate agency that’s been helping people find new homes and commercial properties in and around Saratoga Springs since 1969. When they approached Mannix Marketing for a new website their goals were to make the website easier to navigate so potential clients could explore Roohan’s property listings, make the property listings more visually appealing, and make their entire website user-friendly across devices- all while promoting the Saratoga lifestyle with a warm, friendly, and elegant vibe. But these needs were just a means to an end: the main goal was to drive more sales leads to their team of professional real estate agents. When people arrive on Roohan Realty’s new website, the featured properties are front and center along with an easy-to-use property search form- allowing visitors to quickly and easily find what they’re looking for directly from the home page. The new photo-driven look is designed to capture visitors’ attention and entice them to click-through to a featured property. Upon landing on the property page, custom designed calls-to-action and user-friendly contact forms make it clear how visitors can get in touch with Roohan’s professional real estate agents. The new main navigation menu is intended to help visitors find properties that best match their needs, while a secondary navigation menu located at the top of the site features links to Roohan’s “get to know us” pages. The agency’s phone number, inquiry forms, and social media icons are prominently displayed throughout the site to help buyers connect with Roohan Realty and start the process of finding their new dream home or commercial property. 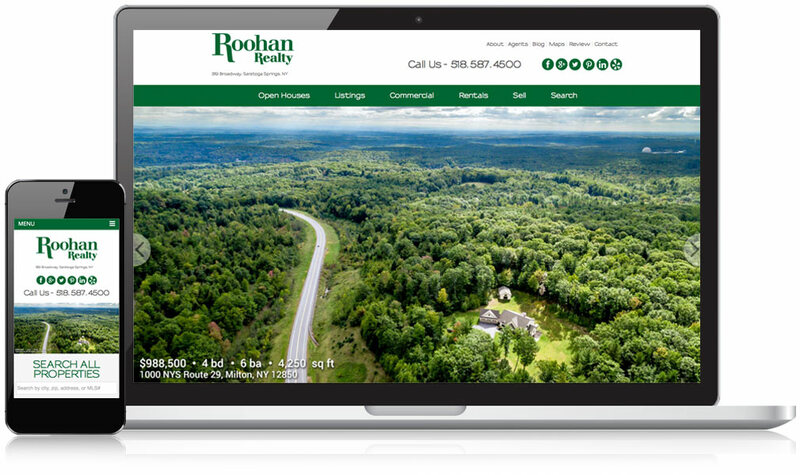 By creating the new website with responsive design, visitors can navigate through the site, browse properties, and contact Roohan Realty all from their desktop or mobile devices.